Industrial Bar code Scanner - Big Sales, Big Inventory and Same Day Shipping! AREX 400 is the top performance family of laser markers based on Fiber Laser Technology, dedicated to industrial Direct Part Marking (DPM) applications. With an IP64 environmental resistance on the marking head, native communication protocols, quiet operations and embedded Safe Laser Off (SLO) option. The Datalogic SCS1 Smart Camera offers visual inspection functionalities, with the simplicity, dimensions and price of an advanced sensor. SCS1 is a completely integrated device and can work in a standalone mode, without any external control unit. The configuration is made through a PC via Ethernet interface, thanks to an user friendly graphic interface supplied with the product. Many different models are available: with/without integrated illuminator, serial interface RS-232 or RS-485. The Honeywell MS4980 VuQuest is a compact area-imaging scanner that offers aggressive scanning of all 1D, PDF and 2D barcodes in a lightweight, durable and portable form factor. 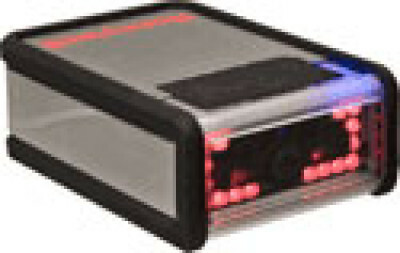 The scanner also features a sleek and elegant design that blends seamlessly in retail environments. The Quadrus EZ FLEX is the ultimate flexible imager for decoding linear and 2D codes in traceability applications. The imager's core is Microscan's patented Quadrus technology, including robust decode algorithms for any symbol. The Quadrus Quadrus EZ FLEX provides unlimited potential through compatibility with any C-mount lens or external lighting solutions. Microscan also offers packaged kits for ease of integration. The Quadrus Mini is the smallest imager available, measuring 1"(25.2 mm) x 1.8" (45.7 mm) x 2.10" (53.3 mm) and weighs less than 2 oz. The short height is especially useful for fitting in small spaces under conveyors and the light weight for mounting on robotic machinery. The Quadrus Mini decodes linear barcodes or 2D codes omni-directionally in moving applications at speeds up to 100 feet per minute (0.5 meters per second). The high resolution zero-distortion optics, diffractive full field illumination and a wide scan window allow linear and 2D codes as large as 2" (50.8 mm) square to be read as close as one inch (25.4 mm). The processing power of 3 megapixel imaging provides the highest resolution and widest field of view of any mini ID imager.Automatically read different codes, at varying distances, while in motion with the Quadrus Mini 3. Dynamic real time autofocus ensures that no manual optics adjustmentsare needed.Q-Mode algorithms provide the most consistent decoding available for a wide range of code types. Q-Mode also enhances the Field of View and adds the ability to decode Micro QR, Aztec, and Postal codes.